That evening, Thorberg was waiting in the pavilion when I walked up, over the bridge over the moat. Thorberg Nordlicht: does it create a virtual 3d environment just like Second Life? Thorberg Nordlicht: i see; you wanted no gravity for outer space, right? Rowan walkd in, followed by Steve who had a bit more trouble arriving, and Dakini. Pema Pera: Hi Rowan, great to see you again! Pema Pera: Good evening, Dakini! Rowan Masala: are we gonna be talking about Newtonian equations tonight? Pema Pera: haha, we could! Pema Pera: Steve is excited enough to do so! Pema Pera: where did he go now? Pema Pera: exactly, well, Thor, you got it! Thorberg Nordlicht: so, how do i find this alleged zero-G sim? Neela appeared as well. Steven had stopped swimming and jumping, and now he stood there, still completely grey, except for his shoes, and ruthed. Pema Pera: A grey ruth clothed only in black shoes . . . .
Rowan Masala: Stevie, was the place with the orbital hold poseballs called Zero Point? Dakini mentioned her new teleport hub, for connecting different PaB land locations. Dakini Rhode: so you can TP to all the PaB locations…. stevenaia Michinaga: how many are there? Pema Pera: wonderful, thanks a lot, Dakini! Thorberg Nordlicht: approximately how many we talking about? Pema Pera: Let me count how many sims we have spread out over . . . just a sec . . .
Thorberg Nordlicht: i didn’t know that!? Rowan Masala: you have 14 sims!!!??? Thorberg Nordlicht: how many “sims worth” does it add up to? Pema Pera: so lots of room for y’all to play in! 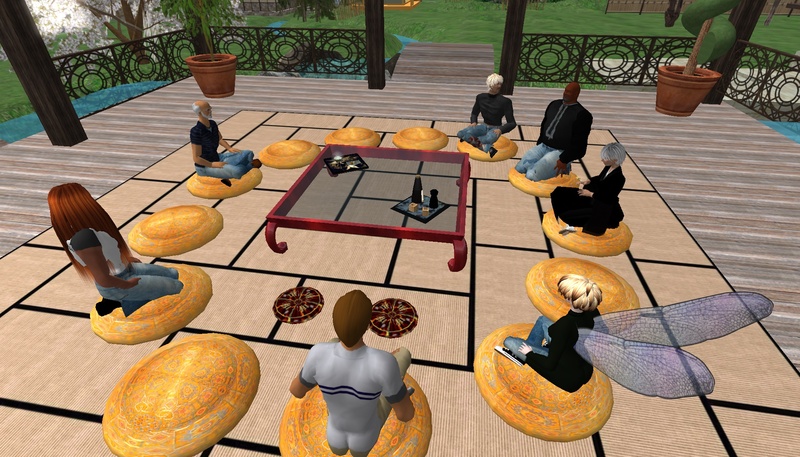 Yes, the PaB land is not cheap, but fortunately, the Fetzer Foundation has been generous in its grant to Stim and me, for the study of virtual worlds in the context of modern contemplative approaches. Thorberg Nordlicht: I guess I never heard that part of the story before. Is that their motivation for funding this? An experiment to see how it works in the much cheaper virtual realm? Pema Pera: Welcome back in our new place! Dharma arrived, and it was her first visit to our new pavilion. Pema Pera: oh no not at all, Dharma! Carlos Cornelius: Hi! It is good to be here. So is this the new Pab spot? Carlos Cornelius: wow, it is really nice, congrats! Carlos joined us as well, so there were now again seven of us, since Neela had left. Thorberg Nordlicht: hello, Avastu! Welcome! With Avastu arriving, there were eight of us. Thorberg Nordlicht: Avastu, you have your own group here in SL? Dakini Rhode: oh yes, but that is for the playasbeing practice…. Pema Pera: do you have another blog? Pema Pera: for Zen Retreat? Pema Pera: ah, perhaps time to set one up . . . .
Avastu and I talked about playing, and he gave me a present. Pema Pera: yes, that is one way to say it. Pema Pera: but those are of course just words . . . .
Pema Pera: Chocolate Disco 2 ! ? ! ? After I tried out the new version of the chocolate disco dance, Dakini had to leave. For ten minutes, nobody spoke, a far longer silence than we have ever had in a Play as Being session, so far. I returned to the opening topic that evening, the work that my astronomy colleagues and friends had been engaged in the last few days. Dharma Voyager: do you know who made the video? Pema Pera: How did you meet Adam? Pema Pera: wow, how nice! Pema Pera: would you like to be on our email list, Dharma? Pema Pera: ah, yes, now I remember! Pema Pera: what email address shall I use? Dharma Voyager: ooooo several e-mails a day? I gave a quick impression of how important this week had been for me. During the last eight years I have tried, if various ways, to use non-standard visualization techniques from outside astronomy in order to apply them to our professional simulations, and finally we have now reached a solution that seems totally satisfactory, at least in principle. Of course, it is also a new beginning, since now we have to put in all the details. Pema Pera: This week has been really very gratifying, in a sense the end and the beginning of what I wanted to do in virtual worlds for my work . . . . . .
Pema Pera: an amazing intersection of my interests in science and in contemplation . . . . .
Pema Pera: this week really was the watershed. Pema Pera: the medium called for it . . . .
Pema Pera: Thanks for coming over, Avastu, Carlos!